One USD art professor utilized his time off to create what he loves most. Michael Hook, associate professor and an art foundations coordinator, has been teaching at USD for 11 years. Last year, Hook went on a sabbatical to work on his art. Hook was in Wyoming for five weeks for his Jentel Artist Residency, which he said really gave him the opportunity to explore and focus on his art. Some of the artwork he made during that time is currently on display in the John A. Day Gallery in the Fine Arts building. The gallery includes acrylic and oil paintings and a video he produced. 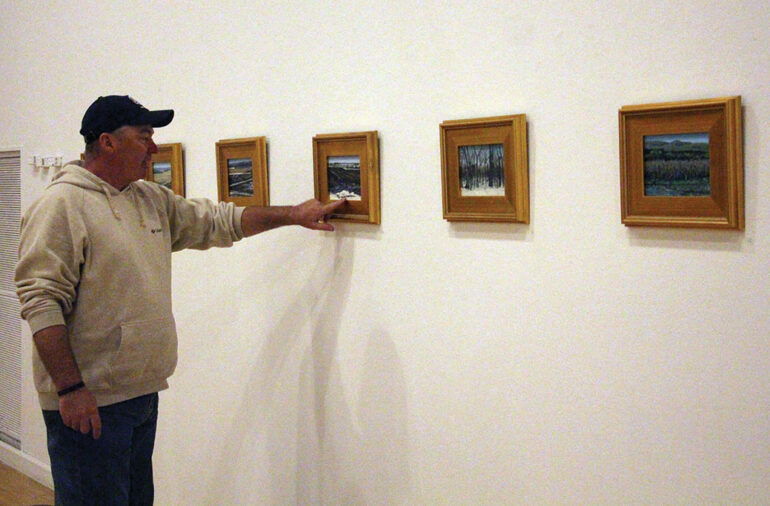 Hook’s exhibition, called “Lessons in Landscape: Perception to Abstraction,” will be on display until March 31. On that Friday, there will be a closing reception from 6 to 8 p.m.
Hook said all the artwork was made in 2016 and most of the oil paintings were made during his sabbatical. “I probably made some 60 pieces during the time and these are the 40 pieces that I thought were the strongest out of the bunch,” he said. As for the video Hook produced, he said he didn’t know what he wanted it to be about until he took a sabbatical. Braveheart said that while he hasn’t had the opportunity to take any of Hook’s classes, he has visited with Hook and listened to his philosophy as a professor of art. He said he’s been able to learn more from his participation in critiques with Hook. Hook thinks art is about sharing and making art is about communicating. To him, art is a community, he said. Hook said he didn’t think about becoming an artist until he was at Columbia College. As for his job as an art professor, Hook said the number one thing he likes about it is the energy he gets from young people. Energy is also something Braveheart has noticed in Hook. One thing Hook often tells his students is that if they really love art, it will show them what to do and where to go.